This updated material is absolutely necesary for Master Teacher Institute teachers who would like to be updated. The new Training Manual and Related Readings are the latest edition from Family of The Americas. The PowerPoint presentation contains 400 graphs that coincide with the 12 units of the Training Manual. 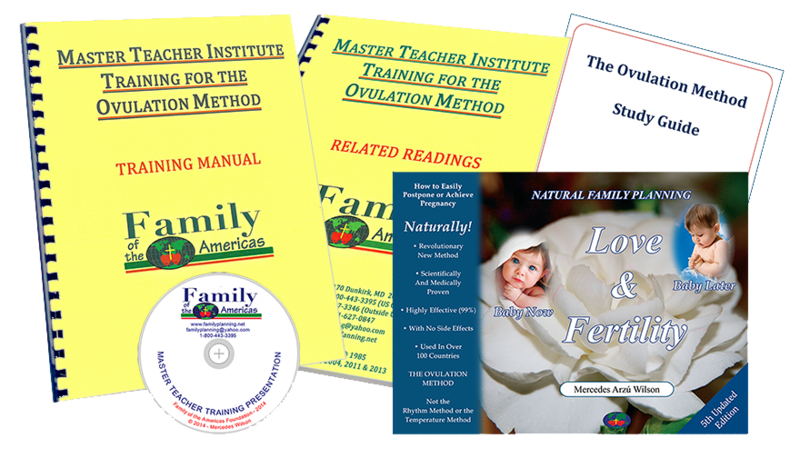 The Ovulation Method Study Guide is essential for teachers who wish to update and receive their new certificate from Family of The Americas. They will need to pass a test that Family of The Americas will provide to them. The Love and Fertility 5th. Update Edition is a beautifully illustrated full color book that introduces the revolutionary new method, the Ovulation Method of Natural Family Planning, in an easy to understand format. Provides practical information along with the latest scientific research and statistical evaluations from around the world. Includes the 6 month charting kit and a unique computer program that contains 2 half-hour videos: Love and Fertility and Natural vs. Artificial. Also available in Spanish and many other languages. This book has been translated into 23 languages.